The Fargo-Moorhead RedHawks signed Brennan Metzger as a free agent on March 8, 2018. Metzger, 28, joins Fargo-Moorhead after spending the 2017 season with the Sonoma Stompers of the Pacific Association. He hit .312 with 40 RBIs and seven home runs in 66 games for Sonoma last season. 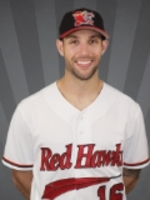 Originally a draft pick of the San Francisco Giants (22nd Round in 2012), Metzger spent three seasons in affiliated baseball before joining the Gary SouthShore Railcats in 2015. He played for Gary and Laredo in 2016 before moving to Sonoma last year.